I’m watching the Oscars, even though I didn’t get a chance to see any of the movies, so I’ll make this fast. I wanted to just give a little update on yesterday’s fiasco. Shortly after I hit publish on yesterday’s post I told the kids that if I made their beds, they had to do the rest. And guess what. They did. I just helped show them where to put stuff since they definitely needed some help with that. I gave them the rest of their lunch and later at dinner asked Caleb what he learned. He said, “To play with one toy at a time and then put it away.” It may seem harsh to give them lunch late, but it’s been a struggle at times to get them to put their toys away. I want them to understand organization and cleaning up after themselves, at least as much as a 3 and 5 year old can. It starts now. I know that as they get older they will remember these things we teach and repeat over and over to them. Caleb already knows it’s dangerous to text or look at your phone while driving because we say it over and over as we are driving. So at the end of the day, they were fed, cuddled, loved, and they learned a lesson. Ok, now i’m off to try to catch who won Oscars for movies I didn’t see. 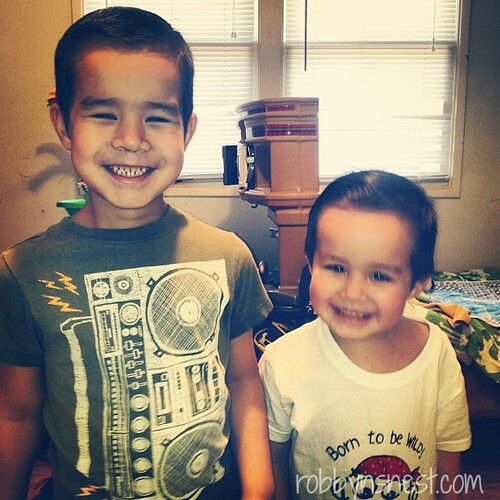 I leave you with a somewhat blurry photo my hubby took of the boys new haircuts. Don’t you just love them?? You know what’s missing??? A sister….